Couldn't have asked for a better real estate Team to represent me! The Banasco Real Estate Team is the best of the best! They're professionals who have such a great attitude that you feel like your're old friends right out of the gate! We had seen many of Nolan & Dean's ads over the years, and they had sold one of our neighbours house for a record breaking price just before we listed the first time around, so we decided to give the Banasco Bros a call. After less than 1 week on the market, we had multiple offers and sold for way more than expected! We chalk this up to their dedication, market knowledge and drive to do the best job possible for their clients. Except for Nolan's obsession with muskoka chairs they made all of the right recommendations and our house had never looked so good! I wanted to buy it all over again! We couldn't be happier and we will use the Banasco Real Estate Team again for all of our future real estate needs. We can't wait until they come back to vacuum again! 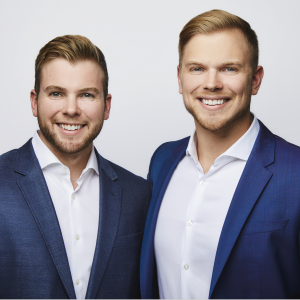 Both Nolan and Dean stepped outside of the box when they helped us sell our home in Mississauga. Nolan and Dean are very detailed oriented; they understand the market and their role very well. We highly recommend using the Banasco Real Estate Team if you plan on selling your home. they made the selling process enjoyable, educational and successful.